these are the finest ever remembered there...In consequence of the scarcity of barrels, not one half of the fish of St Ives can be cured for the West Indies market…..The last accounts from the Mediterranean, afford strong grounds to hope that the Italian market will be opened to our fish before Christmas. Exactly what grounds there were for supposing that the Italian market might be open by Christmas is hard to imagine. Following the defeat of the Prussian army at Jena on October 14th 1806 and the treaties of Tilsit in July 1807 Napoleon was at the zenith of his power, the so-called Continental System was in place, putting Britain under a trade embargo with most of Europe, designed to starve the country of export earnings thereby weakening the economy and the ability to supply and reinforce the army and navy. The Continental System was no short-term tactic, it was a long-term strategy, the Italian market was not going to by Christmas. 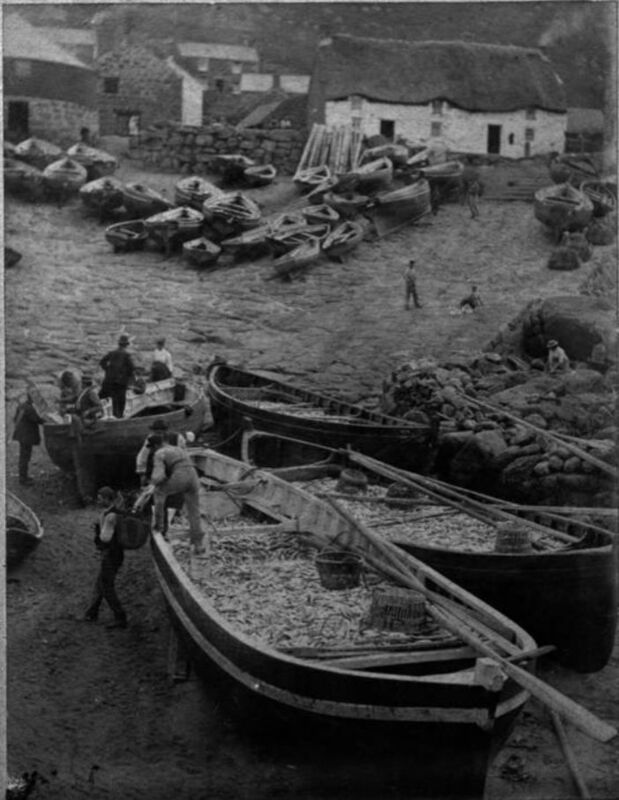 In an effort to find a market the Cornish began to pickle their pilchards and send them to the West Indies, hence the reference in extract above, but lack of experience in the pickling business meant an inferior product which was not well received and the market did not thrive. The Italian market remained closed to Cornish pilchards until after the defeat of Napoleon at Waterloo in 1815. Ironically 1814 and 1815 were not good years for the pilchard fishery so the reopened markets did not lead to an armada of brigs and schooners taking hogsheads of pilchards to Genoa, Leghorn and Naples. The years of the Napoleonic Wars saw the odd vessel bound for the Mediterranean but they were few and far between. On 8th October 1808 the Foy, Captain Oats, left Fowey with fish for Malta and on 8th December 1808 the Howe left Penzance with fish, again for Malta. Malta had been held by the British since 1802 and these two shipments would have formed part of the supply effort rather than being sales into overseas markets. The RCG reported on 12th January 1811 that the previous season's pilchard fishery had failed and not until December 1814 do we find a vessel leaving St Ives with fish for Italy. On 10th the Ann, Captain Cornish, left for Naples, but the trade didn't really start to pick-up until the following year. The RCG of 14th October 1815 carried an advertisement in which a vessel was wanted to carry 500-600 hogshead of pilchards to Italy. This would have been a 90-100 ton schooner or brig, such as the Eldred, which has been covered elsewhere in On This Day. November and December 1815 saw four vessels leave Penzance for Venice, Naples and Leghorn, but 1814 and 1815 were again poor seasons and with few fish landed exports to Italy were low. However the shortage of supply meant higher prices and according to Hamilton Jenkin they reached 108 shillings per hogshead in 1815. Thereafter they moved between 30-50s per hogshead. Compare those prices to the half a guinea per cartload for fish used as manure in 1808 and the decline in income for fishermen during the Napoleonic period becomes obvious, even if a small cartload only equates to two hogsheads, that's 10/6d as manure compared to 60/- minimum on the Italian market, a loss of earnings of over 80%. A little free trading might be viewed as the inescapable consequence of such a severe impact. A hogshead is a wooden barrel. The 1937 Whittaker's Almanac defined a hogshead as being equivalent to 1.5 barrels ie 54 gallons, but the 1897 edition defines different gallon equivalents depending on what commodity is in the the hogshead. A claret hogshead is 46 gallons, port is 57 gallons, sherry is 54 gallons. According to Hamilton Jenkin a hogshead would generally hold about 3000 fish, so when Eldred sailed to Italy in December 1830 carrying 510 hogsheads she was carrying in excess of 1.5 million fish.